I’ll admit, I am a creature of habit. I can go for weeks having the same chicken schnitzel wrap for lunch (to a point where I am walking towards the sandwich shop and they will start preparing the wrap for me). Probably, my most un-blogger like behaviour is my ability to go to the same restaurant and order the same dish over and over again. When traveling however, I’m totally different. I have no inclination to go to the same restaurant and have never ordered the same dish twice. That is until I tried Locanda Verde’s zucchini bread which was pretty amazing. Think a rich tea cake speckled with grated zucchini and a cinnamon undertones. Think a generous dose of toasted pine nuts and a crumbly sugary topping… freshly baked or toasted – with a dollop of butter – no wonder this warranted a second visit! Now, I wasn’t able to get my hands on Locanda Verde’s recipe but was lucky enough to stumble on Manggy’s blog where he recreates Tartine’s Zucchini and Orange Marmalade Tea Cake. 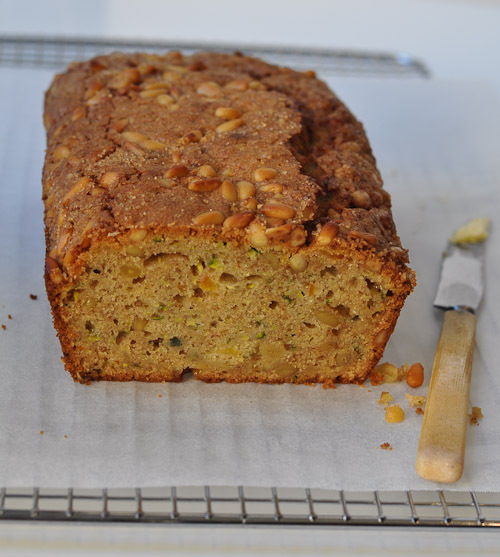 I substituted pine nuts for the walnuts that was called for in the original recipe and here you have it – a replica of the absolutely habit forming zucchini bread I once tasted from Locanda Verde. In one bowl sift the flour, baking soda, baking powder, cinnamon and salt. Set aside. In another bowl, beat the eggs, oil, sugar, and marmalade until combined. Now, incorporate the zucchini. Add the flour mixture to this and mix until combined. Incorporate the nuts into the mixture (leaving some for the topping). Pour the batter into the loaf pan and smooth the surface with an offset spatula. Sprinkle with the brown sugar and a handful of pine nuts. Bake for 50 to 60 minutes or until a cake tester inserted in the center comes out clean. Remove from oven, and let cool for about 20 minutes on a wire rack then remove from the loaf pan and invert onto the rack. Turn this right side up and let cool completely. Place the zucchini into the TM bowl and set to speed 6 for 4 seconds. Add the eggs, vegetable oil, sugar and orange marmalade. Using the butterfly attachment (from steps 2 to 4), mix on speed 4 for 15 seconds. Add the flour, baking soda, baking powder, cinnamon and salt and mix on speed 4 for another 15 seconds. Add the toasted pine nuts (leaving some to top the loaf) and mix on speed 4 for 10 seconds. Pour the batter into the pan and follow baking instructions above. p.s. I’m on my third slice and about to get another one! @ Delia – so glad to hear you enjoyed it!! What a great idea to add some cream cheese – I must try it myself one day. I have been looking for a good zucchini cake that doesn’t have chocolate in it. Made one yesterday. Like the marmalade in this one so I’m BMing this to try out. This cake sounds tasty, Trissa. I’ve made sweet zucchini bread on its own and with chocolate, but I haven’t thought to add citrus flavors. I’m inspired now and must try this next time I have zucchini on hand. That looks so moist! I wish we had enough zucchini at home right now to make some! Looks like an amazing bread! Your pictures capture it so well! O this looks so good Trissa… I have to confess that my experiences with a thermomix are not really that positive. I thought the food came out overcooked and plastic, but hey, that was probably all my doing I think…. I don’t think I have ever had zucchini cake in such a form but it looks gorgeous! This looks delicious! And a great idea for the zucchini surplus this time of year. love those pine nuts, in that gorgeous orange teacake….it looks delicious! I have been looking more into a thermomix too! Now all I have to do is try and find that much money….yikes….they are expensive! Love the pinenuts embedded in the top of the cake. 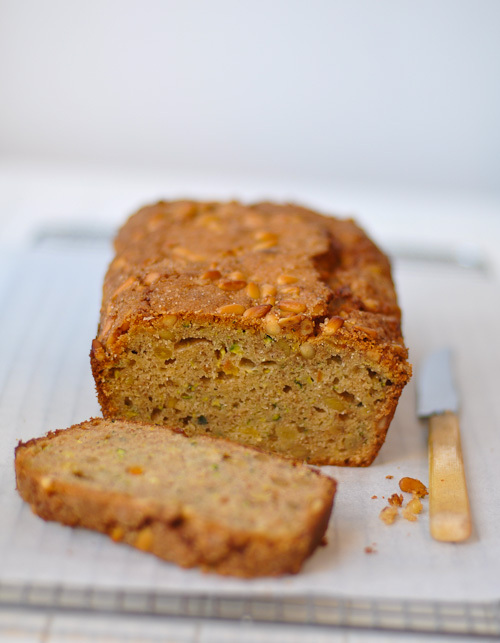 And zucchini – it’s the best veg ever, especially in a cake. Good to see you are putting your thermomix into good use. Love zucchini cake but never had it with marmalade. Must try soon. haha, I’m very much the same. I went for a few weeks on chicken schnitzel with coleslaw sandwiches when I first started at a new job as there were no decent places around to eat. Plus, I didn’t want to bring my lunch in!!! I love citrus-based tea cakes! You had me at “crunchy sugary topping”. I can almost taste the crunchiness… the sugar… everything! Delicious my dear! I love a good tea cake/sweet loaf. I see you are getting great results with the Thermomix! I like how this straddles the sweet/savoury line so nicely. I don’t think I’ve had pine nuts in anything sweet before! Great recipe. I have always love pine nuts. Thank you for sharing this. Yum! I recently made a carrot, apple and zucchini cake. My first time at putting zucchini in a cake and it worked wonderfully. This bread looks so good I wish I had a slice a couple of hours ago – to go with my hot chocolate. I’ll take my slice toasted, please. I can’t believe I missed this in my Tartine cookbook. I’m so behind trying recipes from my books. This looks like a weird and wonderful combo- p.s cannot believe you chucked a tantrum and got a thermomix! I think I might give that a try!! This loaf looks great! The flavour combination must be delicious! I love pine nuts! I love tea cake with marmalade. It is especially nice if you can make the marmalade yourself as I think it makes a big taste difference. This looks delicious! I don’t know why, but zucchinis are one vegetable I always find difficult to find ideas of how to use them, so this recipe really sounds like something I would love to try! The bread/cake looks dense, moist and delicious. Congradulations on getting your Thermomix! When did you get it? What inspired you? I didn’t know you were in Australia! I thought… for some reason, you were in the US. I got the e-mail from Lynette about your macaron making in the Thermomix. Really? I can hardly make them by hand! Isn’t it a wonderful machine. I have two. I sell them, so I need two to do demos… but cannot live without mine anymore. Such healthy food and so timely. This recipe looks yummy. I apologize for not keeping up with my readings. We left for Paris mid July and are currently in Belgrade. We’ll be home sometime next week – and I cannot wait to be home. I love to get away, but going home is just as exciting. And this time, In have had so many fascinating culinary experiences, that I cannot wait to practice in my kitchen at home! So moist and I’m sure so delicious. I love this sort of cake. Thanks for the recipe! I have to admit, I’m the same way. If I like something, I tend to stick to it, because when it comes to food, I really hate to be disappointed.